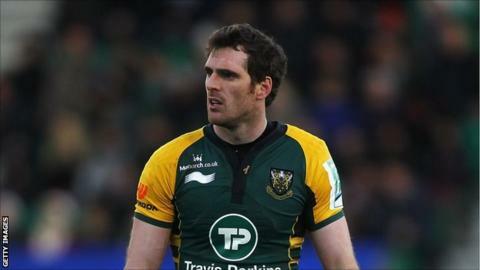 Worcester Warriors coach Richard Hill has made another signing for the 2012-13 season by bringing in centre Jon Clarke from Northampton Saints. The 28-year-old, who has been at Northampton since 2003, has made 165 appearances, scoring 32 tries, as well as playing twice for England Saxons. Worcester have also signed two forwards from Championship side Rotherham. Props Rob O'Donnell and Semisi Taulava will both arrive at Sixways over the summer in time for next season. "I felt I needed a change," said Clarke. "I spoke to Richard Hill and was really impressed by his vision. "I feel I can play a role in the club moving up another level and want to learn new things and develop." Hill, who has already signed up Scotland winger Nikki Walker and former England forward Dan Schofield, said: "We are very excited that Jon will be joining us next season. "He is vastly experienced after playing at one of the top clubs in the country for many seasons. "He is physically a very powerful man and has the ability to offload and break the advantage line. "Jon is multi-skilled, as he can operate at 12, 13 or 15, and will add a great deal to our midfield options."